Why We Pray for the Dead. 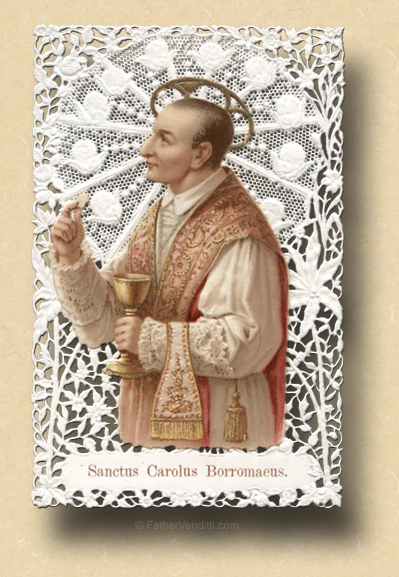 The Memorial of Saint Charles Borromeo, Bishop. • Philippians 3: 17—4: 1. • Psalm 89: 2-5, 21-22, 25, 27. • Ecclesiasticus 44: 16-27; 45: 3-20. • [Gradual] Ecclesiasticus 44: 16, 20. • II Thessalonians 3: 6-18. • Matthew 4: 25—5: 12. 4:05 PM 11/4/2016 — We mark the First Friday of November this year by observing the Memorial of Saint Charles Borromeo, who kind of started off on the wrong foot. Born in 1538, he rose through the ranks of the clergy very rapidly primarily because his uncle was Pope Pius IV; that was emblematic of the corruption that was rampant in the Church at the time. By the time he was twenty-two he was already a cardinal and his uncle’s secretary of state, but he turned out to be very effective. When Saint Pius V became Pope and announced his determination two wipe out all the corruption and implement the reforms of the Council of Trent, he became the new Pope’s right-hand man, establishing the first modern seminaries for the training of priests, and the principle author of the Catechism of the Council of Trent. He went on to become Archbishop of Milan, and was regarded as a model pastor by none other than Saint Francis de Sales. He died in 1584 at the age of forty-six. His memorial is not optional, which is why we’re not offering the Votive Mass of the Sacred Heart, but we will nonetheless expose the Blessed Sacrament at the end of Mass and pray together the Litany of the Blessed Sacrament. You will then have the opportunity to keep company with our Lord until one-thirty, when we will conclude our Holy Hour with Benediction. During the Holy Hour, I will return to the confessional for the benefit of anyone who was not able to confess before Mass. And, yes, a confession made today does fulfill the obligation for those keeping the Five First Saturdays; and, if you're planning to be here for tomorrow's Mass and Holy Hour as well, you might consider making your confession today rather than waiting until tomorrow, as it might help to ease the number of those not here today who will be looking to make their First Saturday devotion tomorrow. Today’s Gospel lesson, the parable of the Knavish Steward, we discussed a few weeks ago as it occurred on a Sunday;*** so, I would rather like to focus our attention today on expanding on the thoughts we shared on All Souls day. Judas rallied his army and went to the city of Adullam. As the seventh day was approaching, they purified themselves according to custom and kept the sabbath there. On the following day, since the task had now become urgent, Judas and his companions went to gather up the bodies of the fallen and bury them with their kindred in their ancestral tombs. But under the tunic of each of the dead they found amulets sacred to the idols of Jamnia, which the law forbids the Jews to wear. So it was clear to all that this was why these men had fallen. They all therefore praised the ways of the Lord, the just judge who brings to light the things that are hidden. Turning to supplication, they prayed that the sinful deed might be fully blotted out. 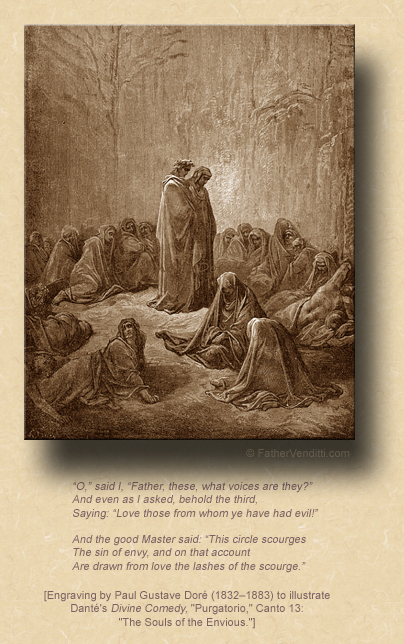 The noble Judas exhorted the people to keep themselves free from sin, for they had seen with their own eyes what had happened because of the sin of those who had fallen. He then took up a collection among all his soldiers, amounting to two thousand silver drachmas, which he sent to Jerusalem to provide for an expiatory sacrifice. In doing this he acted in a very excellent and noble way, inasmuch as he had the resurrection in mind; for if he were not expecting the fallen to rise again, it would have been superfluous and foolish to pray for the dead. But if he did this with a view to the splendid reward that awaits those who had gone to rest in godliness, it was a holy and pious thought. Thus he made atonement for the dead that they might be absolved from their sin (2 Maccabees 12: 38-46 NABRE). Now, the historical context of the two books of Maccabees is the revolt of the Jews, led by Judas Maccabeus, against their pagan captors. This can be a little confusing if you attempt to read them straight through, since the one is not a sequel to the other; in fact, the human author of Second Maccabees tells us the his book is really an abridgment of a five-volume history of the Jewish revolt which no longer survives. Nevertheless, the book is filled with a lot of important theology, not the least of which being that it's the first mention in Holy Writ of a belief in the resurrection of the dead, albeit in a non-Christian context. You might recall, from a couple of homilies last year,—or is that wishful thinking?—looking at the sub-plot beneath our Lord's frequent sparring matches with the Sadducees and the Pharisees, and how these two groups of rabbis were very different in their theology: the Sadducees (sometimes called "Scribes") represented the “old guard,” the guardians of Jewish tradition which did not believe in a well-defined after-life and which restricted Jewish worship to the Temple in Jerusalem; the Pharisees were a new group who introduced a lot of innovations that upset the Sadducees, such as the Synagogue service and, most particularly, the notion of an after-life and a resurrection from the dead. In the practice of their religion, our Lord and His disciples were clearly Pharisees, as they worshiped regularly in the Synagogue and preached a resurrection; and, it's here in Second Maccabees, just sixty years or so before our Lord's incarnation, that we have the first appearance in Scripture of this Pharisaical tradition. So, here in Second Maccabees we find Judas Maccabeus discovering, on the bodies of his fallen soldiers, evidence that they had lapsed into pagan practices, and he becomes convinced that this is why they lost the battle and were killed: God was punishing them for having abandoned their faith. So, he orders that a collection be taken up, and that this be sent to Jerusalem so that sacrifices might be offered in the Temple for the repose of their souls, so that, even after death, they might be released from punishment. Not only does it point to the existence of a state of punishment and purification which is not eternal—which we call Purgatory—but also points to the fact that these souls can and are helped in that process by the prayers and sacrifices of the living. And it shouldn't require too much mental gymnastics to see how Holy Mother Church has preserved this Biblical tradition, as we are well familiar with the custom of making a donation to have the Holy Sacrifice of the Mass offered for the repose of the souls of those we have lost, so that the real Sacrifice of the true Altar, of which the sacrifice in the Temple was only a symbol, can speed these souls on their journey and keep them safe until the final resurrection. And as you all know, the early Christians in Rome, fleeing official persecution, often gathered in the city's underground cemeteries to offer the Holy Sacrifice in secret; and, as the persecutions grew in their ferocity, those catacombs began to fill with the bodies of the saints. More often than not, the Holy Sacrifice was offered using the tombs of these saints as altars, which would lead to the practice of embedding a relic of a martyr in every consecrated altar, a practice the Church continues to observe to this day. Every day, I announce the intention for which the Holy Sacrifice as been requested; and, while it's not always for the dead, often it is. And we know that we, too, can give a donation to have a Mass offered for our intentions, the intentions of others and, most appropriately, for the souls of our loved ones who have passed. So, on this First Friday of the month of November, I encourage you to remember in your Holy Hour today the souls of the faithful departed, that, through our prayers and the Most Holy Sacrifice of our Lord's Body and Blood, our Blessed Lord will speed their souls on their journey and keep them safe until the end of all things, when this world will pass away, and we shall all see our God face to face. * During the reign of Emperor Diocletian, Agricola, servant of the nobleman Vitalis, suffered terrible tortures for his faith, praying all the while with great fortitude. His master, inspired by this example, converted at the sight, and they were crucified together in Balogna in 304. ** Joannicus was born in Marycate, Bithynia, in 754. He served in the Imperial Army, then retired to Mount Olympus in 795 to live as a hermit. He died in 846 during the time of the Holy Patriarch Methodius. The holy, glorious and right-victorious Hieromartyr Nicander of Myra (also Nikandros) was the first Bishop of Myra, centuries later the See of St. Nicholas. He, with his fellow martyr, the priest Hermas, were followers of the Apostle Titus, who had ordained them. Living the ascetic life amid incessant pastoral works, the saints converted many pagans to Christ. For this they were arrested and brought before the city prefect, Libanius. Neither flattery nor threats swayed the holy martyrs to renounce Christ, so Libanius gave orders that they be tortured. They endured fierce and inhuman torments: tied to horses and dragged over stones, their bodies were raked with iron hooks, and they were cast into a hot oven. The Lord helped them endure things that a mere man by his own strength could not endure. Towards the end, iron nails were hammered into their heads and hearts. They were thrown into a pit, then covered over with earth, sometime around AD 95. *** Cf. The post of 9/18/2016.